F'd Up Xrays The most shocking, horrifying and hilarious x-rays. An Arizona man is lucky to be alive after he accidentally impaled his eye socket with a pair of pruning shears, doctors said Monday. Leroy Luetscher, 86, was gardening outside his Green Valley home on July 30 when the horrifying accident took place. He dropped the shears and they landed blade side in the ground. But when Luetscher went to pick them up, he stumbled and fell face down onto the gardening tool’s handle. 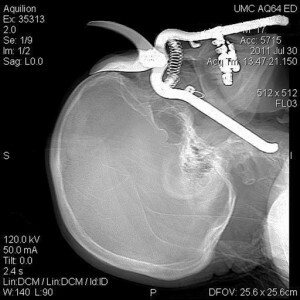 An incredible CT scan, released by the University Medical Center, shows the handle puncturing Luetscher’s eye socket and reaching down into his neck. He was rushed to the hospital with half of the shears sticking out of his head. Surgeons were eventually able to remove the shears and save his eye. Luetscher has some swelling in his eyelids and minor double vision, but he is amazingly expected to make a full recovery, according to doctors. Woman complaining of diarrhea has pen lodged in stomach… From 25 years ago!